Human CMV (HCMV) interferes with NK cell functions at various levels. The HCMV glycoprotein UL16 binds some of the ligands recognized by the NK-activating receptor NKG2D, namely UL16-binding proteins (ULBP) 1 and 2 and MHC class I-related chain B, possibly representing another mechanism of viral immune escape. This study addressed the expression and function of these proteins in infected cells. HCMV induced the expression of all three ULBPs, which were predominantly localized in the endoplasmic reticulum of infected fibroblasts together with UL16. However, while at a lower viral dose ULBP1 and 2 surface expression was completely inhibited compared to ULBP3, at a higher viral dose cell surface expression of ULBP1 and ULBP2 was delayed. The induction of ULBPs correlated with an increased dependency on NKG2D for recognition; however, the overall NK sensitivity did not change (suggesting that additional viral mechanisms interfere with NKG2D-independent pathways for recognition). Infection with a UL16 deletion mutant virus resulted in a different pattern compared to the wild type: all three ULBP molecules were induced with similar kinetics at the cell surface, accompanied by a pronounced, entirely NKG2D-dependent increase in NK sensitivity. Together our findings show that upon infection with HCMV, the host cell responds by expression of ULBPs and increased susceptibility to the NKG2D-mediated component of NK cell recognition, but UL16 limits these effects by interfering with the surface expression of ULBP1 and ULBP2. Human CMV (HCMV)4 is a β-herpesvirus that infects 70–80% of the population of the western world. Under conditions of immunosuppression, it can give rise to several diseases including pneumonitis and retinitis. HCMV plays a role in the rejection of grafted transplants and is also known to cause congenital disorders. Infection is usually asymptomatic in immunocompetent hosts and results in lifelong latency, apparently in cells of the myeloid lineage (1, 2). In coevolution with the immune system, CMV has developed sophisticated strategies to escape innate as well as adaptive immunity. Among the immunomodulatory gene products are US2, US3, US6, and US11, known to down-modulate HLA class I and II molecules, an event favorable in terms of escaping HLA-restricted HCMV-specific T cell responses (3, 4). NK cells are an important component of the early immune defense against several viruses. They are regulated by a complex balance resulting from signals received via inhibitory and activating receptors (5). The inhibitory receptors comprise the killer Ig-like receptors, binding to classical and nonclassical HLA class I molecules, and the heterodimer CD94/NKG2A, binding to the nonclassical HLA-E molecule (6, 7). By means of these receptors, NK cells monitor cells of the body for the presence of normal levels of HLA class I. If these molecules, which usually deliver a negative signal to NK cells, are down-regulated, such as in certain tumors or in virally infected cells, activating signals may prevail, thus triggering NK cells to kill the abnormal target cells and/or to produce cytokines (“missing self” recognition) (8). Thus, how can HCMV solve the apparent enigma of escaping T cell recognition, which is effectively achieved by down-regulation of HLA class I molecules, and at the same time avoid NK cell-mediated immune responses against missing self? There are at least two possibilities. First, HCMV can deliver a virally induced negative signal to the NK cell using a viral peptide and/or a viral HLA class I homologue. HCMV may use this strategy by the respective means of UL40 (containing a peptide able to up-regulate the CD94/NKG2A ligand, HLA-E, on infected cells) (9) and of UL18 (which has been suggested to be involved in negative signaling via the CD85j receptor on NK cells) (10). However, the latter issue is still under debate. Second, HCMV could interfere with activating pathways as has been shown for murine CMV (11). The activating NK cell receptors include the natural cytotoxicity receptors (NKp30, NKp44, NKp46) and NKG2D (12). NKG2D is a C-type lectin-like homodimer that associates with the signal transducing adaptor protein DAP10 in humans. This receptor complex is expressed on NK cells, some T cell subsets, and on activated macrophages (13, 14). The ligands for NKG2D can be grouped into two categories: 1) MHC class I chain-related genes (MICA and MICB) and 2) UL16-binding proteins (ULBP1-3) (13, 15, 16). The ULBPs were recently identified based on their capability to bind the HCMV glycoprotein UL16. They are GPI-linked proteins, distantly related to members of the HLA class I family possessing α1 and α2 domains, but no α3 domain (16). ULBPs cannot present peptides (17). MICA and MICB instead possess all three α-domains and are both transmembrane proteins, but like the ULBPs, they do not bind β2 microglobulin and they do not present peptides (18). In NK cells, the activating signal generated by the interaction of MICs and ULBPs with NKG2D appears, in certain circumstances, to be able to override the inhibitory signal transduced via inhibitory receptors for HLA class I (16, 19). Binding of soluble ULBP fusion proteins to NKG2D+ NK cells triggers cytotoxicity, the release of cytokines and chemokines, as well as the up-regulation of activation markers (16, 20). Although MICs and ULBPs are both NKG2D ligands, they have different expression patterns which may reflect different functions. ULBP mRNAs have been shown to be expressed in a wide range of normal tissues, including heart, lung, testis, bone marrow, and thymus (16), whereas MICs are not expressed on most normal tissues but they are up-regulated on some tumors or in response to heat shock and oxidative stress (18, 21, 22, 23). Until recently, there has been only one report suggesting that MIC is expressed also on HCMV-infected fibroblasts and endothelial cells (24). The up-regulation of MICA has also been described after binding of an Escherichia coli adhesin to CD55 on the intestinal epithelium (25). It has previously been shown that MICB, ULBP1, and ULBP2, but not ULBP3 or MICA proteins, could interact with a soluble form of the HCMV-encoded glycoprotein UL16 and that this interaction can block the binding of NKG2D to its soluble ligands (16). UL16 is a 50-kDa glycoprotein, which was detected in total cell lysates of infected fibroblasts at 24 h postinfection with its expression increasing over time. UL16 has been shown to be dispensable for viral growth in vitro (26). Although colocalization for UL16 and its ligands has been shown in transfected cells (27), to our knowledge nothing is known about the localization of UL16 and ULBPs in HCMV-infected cells. It is also unknown how UL16 influences cell surface expression of ULBPs during infection and how ULBPs and UL16 contribute to the recognition of infected cells by NKG2D-positive NK cells. The purpose of this study was: 1) to investigate ULBP and MICA/B expression in fibroblasts after infection with HCMV (as recently addressed also by Welte et al. (27)); 2) to assess the influence of UL16 on NKG2D ligand expression during infection; 3) to determine the subcellular localization of ULBPs and UL16 in infected cells; 4) to analyze the contribution of NKG2D ligands to NK cell-mediated cytotoxicity against HCMV-infected cells; and 5) to elucidate the effect of UL16 on susceptibility of infected cells to NK cell-mediated cytotoxicity. Human foreskin (HF) fibroblasts were obtained from American Type Culture Collection (Manassas, VA), and human embryonic lung (HL) fibroblasts were purchased from the Department of Microbiology (Sahlgrenska Hospital, Gothenburg, Sweden). Cells were used between passages 19 and 28 (HF) and 12 and 18 (HL). Fibroblasts were cultured in DMEM supplemented with 5–10% FCS, 2 mM l-glutamine, 100 U/ml penicillin, and 100 μg/ml streptomycin. Polyclonal NK cell cultures were derived from buffy coats obtained from the Karolinska Hospital Blood Bank (Stockholm, Sweden). PBMCs were isolated by centrifugation on Lymphoprep gradients (Nycomed, Oslo, Norway). Afterwards, cells were washed and incubated in serum-free IMDM medium for 1 h at 37°C. Nonadherent cells were collected, washed, and resuspended in RPMI 1640 medium supplemented with 10% FCS, 2 mM l-glutamine, 100 U/ml penicillin, and 100 μg/ml streptomycin. Polyclonal NK cell cultures were generated by coculturing nonadherent cells (4 × 105 cells/ml) with the irradiated (3000 rad) lymphoblastoid B cell line RPMI 8866 (105 cells/ml). After 10 days, the percentage of CD3−/CD56+ cells was between 80–95% as assessed by flow cytometry. Different strains of HCMV were used for infection: the laboratory strain AD169 (continuously passaged from 1988), the clinical isolates 4636, 109B, and 3C and a UL16 deletion mutant (AD169ΔUL16) all previously described (26, 28). All strains were propagated on HL fibroblasts. Viral stocks were harvested from the supernatants of HCMV-infected HL fibroblasts at 10–14 days postinfection and stored at −70°C. Virus stocks were titrated using a plaque assay and used at different multiplicities of infection (MOI). Absence of Mycoplasma was confirmed with the Mycoplasma T.C. II Rapid detection system (Gen-Probe; DPC, Skafte, Sweden). Heat-inactivation was performed at 56°C for 1 h.
Confluent cells were either treated with medium alone or infected with HCMV at different MOI (0.5/2/4/8). After adsorption of the virus for 4 h at 37°C, the inoculum was removed and growth medium was added to the cell cultures. Flow cytometry was performed on FACScan instruments from BD Biosciences (San Jose, CA) using mAbs against ULBP1 (M-295), 2 (M-311), and 3 (M-551), UL16 (M-230), MICA (M-673), MICB (M-362), NKG2D (M-585), all of IgG1 isotype. All reagents were previously described (16). Purified anti-CD56 Ab (clone C218, IgG1 isotype) was purchased from Immunotech (Marseille, France). IgG1 isotype control was purchased from BD PharMingen (San Diego, CA). The secondary Abs used were goat-anti-mouse-IgG-PE, goat-anti-mouse-IgG-FITC, goat-anti-mouse-IgG-Texas Red (TR), goat-anti-human-TR (Fc-specific), and goat-anti-human-FITC (Fc-specific), all purchased from Caltag Laboratories (Burlingame, CA). Fibroblasts were grown on 1.5 × 1.5-cm glass slides to confluency and infected with HCMV at a MOI of 1. Three days postinfection, cells were fixed in 80% acetone for 10 min at −20°C, washed, and stained in a 1:1 mixture of ULBP2-Fc fusion protein (16) and anti-ULBP1 or anti-ULBP3 mAb (0.25 μg of each reagent per slide) for 30 min at room temperature. As secondary reagents, 50 μl of a 1:1 mixture of goat-anti-humanFc-FITC mAb (mouse-adsorbed) and goat-anti-mouse-IgG-TR mAb (human-adsorbed) were added to each slide. Wheat germ agglutinin Alexa 594 conjugate was purchased from Molecular Probes (Leiden, The Netherlands). Microscopy was performed on a Nikon Eclipse E400 microscope (Tokyo, Japan) attached to a C4742–98 Hamamatsu digital camera (Hamamatsu City, Japan). The numerical aperture was 1.40 on an oil objective (original magnification: × 100). 51Cr-release assays were used to test NK cell-mediated cytotoxicity. Different ratios of effector cells were incubated for 4 h at 37°C with 5 × 103 target cells which were previously labeled with 100 μCi 51Cr per 106 cells for 1 h at 37°C. In some experiments, effector cells were preincubated with anti-CD56 mAb or anti-NKG2D mAb at 1 μg/106 cells. The percentage of lysis was determined by counting an aliquot of supernatant and using the formula: percent-specific lysis = 100 × (sample release − spontaneous release/total release − spontaneous release). Mean inhibition of lysis (%) (±SD) by anti-NKG2D mAb was calculated in comparison to anti-CD56 mAb using the formula: (1 − (percent-specific lysis with anti-NKG2D mAb treatment/percent-specific lysis of anti-CD56 mAb treatment), × 100. Statistical analysis of the data was performed using a paired Student’s t test. A value of p < 0.05 was considered to be statistically significant. HL fibroblasts were infected with the HCMV strain AD169 at different MOI (2, 4 or 8). Cell surface expression of ULBP1, ULBP2, and ULBP3, as well as of MICA and MICB was determined by flow cytometry on days 1–5 postinfection. Uninfected cells were negative for all five molecules whereas after HCMV infection, expression of ULBP1-3 was first detectable at day 3 and reached its maximum at day 5 postinfection (Fig. 1⇓, data shown only for MOI 2). Interestingly, the kinetic pattern of surface expression differed between ULBP1 and ULBP2 that can bind to UL16, and ULBP3 that is not able to bind to UL16. Whereas the latter was expressed maximally on all infected cells already from day 3, the up-regulation of ULBP1 and ULBP2 was delayed; only at day 5 postinfection had the majority of cells acquired the extent of up-regulated surface expression of ULBP1 and ULBP2. No expression of MICA or MICB was detected in HL fibroblasts under any of the conditions of infection tested (data not shown). Infection with three different recently isolated clinical strains of HCMV (109B, 3C, 4636) resulted in a similar pattern, although the up-regulation of all ULBP molecules appeared to be slower on days 3 and 4 compared to AD169 (data not shown). However, 5 days postinfection, the maximum up-regulation of ULBP1-3 was also reached. Heat-inactivated HCMV did not induce ULBPs (data not shown), so we conclude that viral replication is essential for up-regulation of ULBPs. ULBP1-3 expression in HL fibroblasts at days 3–5 postinfection with AD169 at MOI 2. Shaded histogram: uninfected fibroblast stained with anti-ULBP mAbs; dashed line: infected fibroblast stained with an isotype control; black solid line: AD169-infected fibroblasts stained with anti-ULBP mAbs. Secondary reagent was a PE-conjugated anti-mouse Ab. One representative of seven experiments is shown. Interestingly, NKG2D ligands differed in regard to their response to HCMV infection in fibroblasts from different origins. Although the infection induced ULBPs but not MICA in HL fibroblasts, the pattern was the reverse in HF fibroblasts. 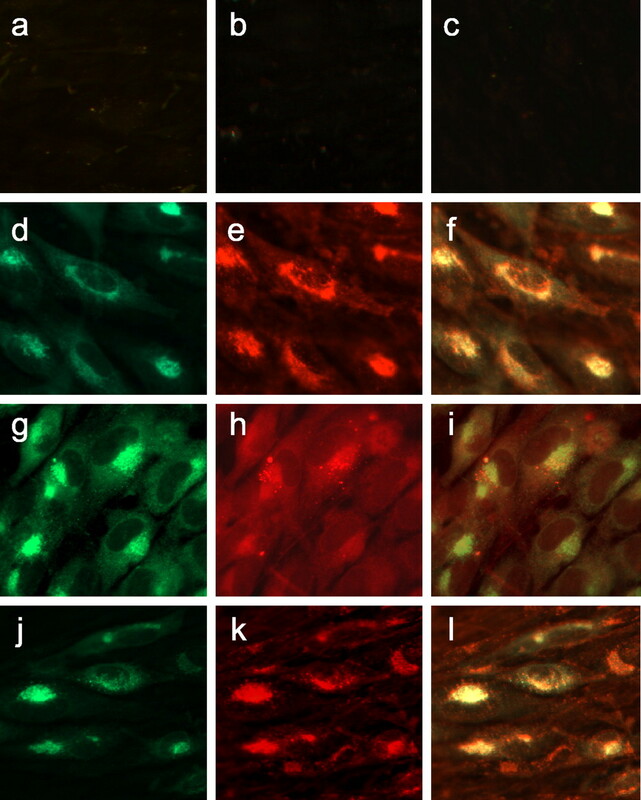 In these cells, MICA was detectable from day 3 postinfection with AD169 and the course of up-regulation resembled that observed for ULBP3 expression in HL fibroblasts (data not shown). However, ULBP3 was not detectable in HF fibroblasts followed up to 6 days after infection, nor were ULBP1 and 2. This difference might be attributed to the different sources of the respective fibroblasts (possibly representing a site-specific regulation of NKG2D ligands), and/or to the polymorphism among the NKG2D ligands which implies that mAbs may not recognize a certain allele. MIC molecules have been shown to be polymorphic (18), while for ULBPs it cannot be ruled out yet (D. Cosman, unpublished data). To further analyze the delayed surface expression of ULBP1 and ULBP2, we performed fluorescence microscopy stainings on fixed and permeabilized infected HL fibroblasts. To visualize UL16 and ULBPs we used a ULBP2 fusion protein able to bind to UL16 (16) and mAbs against ULBPs. As shown in Fig. 2⇓, the very low ULBP1 surface expression at day 3 was not due to lack of expression at the protein level—in fact, ULBP1 was readily detectable within a distinct intracellular compartment with a perinuclear localization, where it colocalized with UL16 (Fig. 2⇓, d–f). Parallel staining with wheat germ agglutinin, which is a specific marker for the ER, indicated that UL16 and ULBPs were both predominantly found in this compartment (Fig. 2⇓, j–l), which does not exclude localization in other cellular compartments. 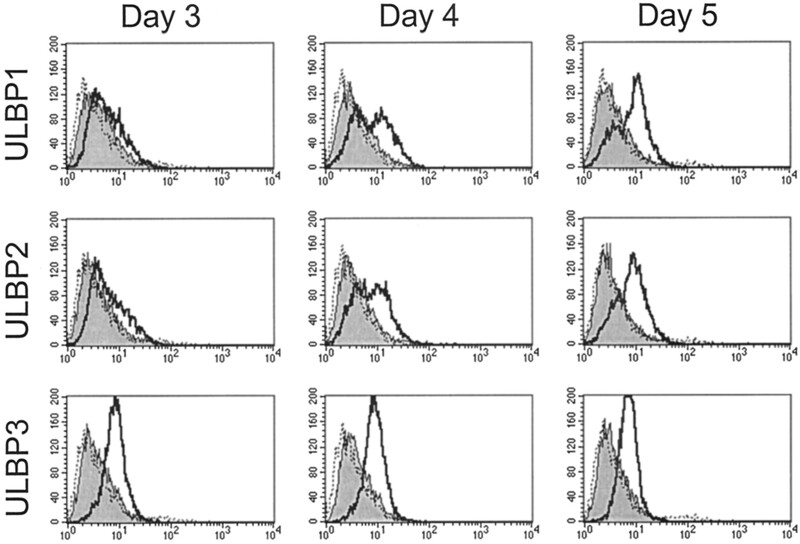 The overall distribution patterns for ULBP1 and 3 were thus distinctly different (Figs. 1⇑ and 2⇓); while ULBP3 was observed in the ER as well as on the cell surface, ULBP1 accumulated solely in the ER. Intracellular staining for UL16 and ULBP1/ULBP3. AD169-infected HL, stained with isotype controls (a). Uninfected HL stained for ULBP1 and UL16 (b). Uninfected HL stained for ULBP3 and UL16 (c). AD169-infected HL stained for UL16 (d), ULBP1 (e), overlay d/e (f), UL16 (g), ULBP3 (h), overlay g/h (i), UL16 (j), wheat germ agglutinin (k), overlay j/k (l). Original magnification: ×100. Next, we tested whether the observed up-regulation of NKG2D ligands had consequences on NK cell-mediated cytotoxicity. Chromium-release assays were performed using polyclonal NK cell cultures from different donors as effector cells and uninfected or HCMV-infected HL fibroblasts (AD169 or 109B at MOI 2, day 4 or 5 post-infection) as target cells. The contribution of NKG2D ligands to specific target cell lysis was investigated by preincubating the effector cells with either a specific anti-NKG2D mAb or the anti-CD56 control Ab (Fig. 3⇓). Contribution of NKG2D to NK cytotoxicity against HCMV-infected cells (MOI 2, day 4). a, Effect of blocking anti-NKG2D mAb on NK cell-mediated killing of uninfected or HCMV-infected HL fibroblasts in 4 h chromium-release assays; preincubation of effector cells with anti-NKG2D (•), anti-CD56 (□, isotype control), or no Ab (▴). b, Reduction of NK cell-mediated killing of uninfected (▪), AD169-infected (□) or 109B-infected (▦) HL fibroblasts by anti-NKG2D mAb (pooled data from four experiments). Mean inhibition of lysis (%) by anti-NKG2D mAb was calculated in comparison to anti-CD56 as described in Materials and Methods; statistical analysis by paired Student’s t test: ∗, p < 0.05; ∗∗, p < 0.01. As previously shown, 109B-infected cells became more resistant to NK cell-mediated lysis whereas AD169-infected cells showed a variable pattern, with an either unchanged or a decreased sensitivity (Fig. 3⇑a) (28). However, in all experiments pretreatment with an anti-NKG2D mAb resulted in a greater extent of inhibition, compared to uninfected fibroblasts. On day 4, NK cell-mediated lysis of HCMV-infected fibroblasts was reduced by anti-NKG2D mAb by 46–75% (at 25:1) and 48–81% (at 12.5:1) in AD169-infected and by 31–72% (at 25:1) and 56–87% (at 12.5:1) in 109B-infected HL fibroblasts (Fig. 3⇑b). In contrast, when using uninfected fibroblasts as targets, the preincubation of effector cells with anti-NKG2D mAb reduced specific lysis to a lower extent (by 22–46% and 28–46% at E:T ratios of 25:1 and 12.5:1, respectively), suggesting that there was a smaller contribution of NKG2D to lysis. The same pattern was seen in an experiment performed at day 5 (data not shown). These results indicated that while NK cell-mediated lysis of uninfected cells was mainly NKG2D-independent, the susceptibility of infected fibroblasts was mainly NKG2D-dependent. It has been shown that UL16 is capable of interacting with MICA, ULBP1, and ULBP2, but not with MICB of ULBP3 (16, 27). However, those studies were based on in vitro experiments with transfected cells and recombinant molecules. Thus, to test whether UL16 does indeed affect the expression of NKG2D ligands during the course of an infection, we performed flow cytometry and functional assays on HL fibroblasts, infected either with AD169 wild-type (AD169wt) or with a mutant virus strain lacking the UL16 gene (AD169ΔUL16) (Figs. 4⇓ and 5⇓) (26). At low MOI (0.5; day 5 and 7), ULBP1 and ULBP2 became detectable only after infection with AD169ΔUL16, whereas infection with AD169wt did not result in any surface staining for these molecules (Fig. 4⇓ and data not shown). At a higher MOI (2; day 3 and 5) AD169wt led to up-regulation of ULBP1 and ULBP2, although this up-regulation was less pronounced and delayed compared to AD169ΔUL16 (Fig. 4⇓, see also Fig. 1⇑). In contrast, the surface levels of ULBP3 or MICA were not altered by the presence or absence of UL16 in any of the conditions tested. 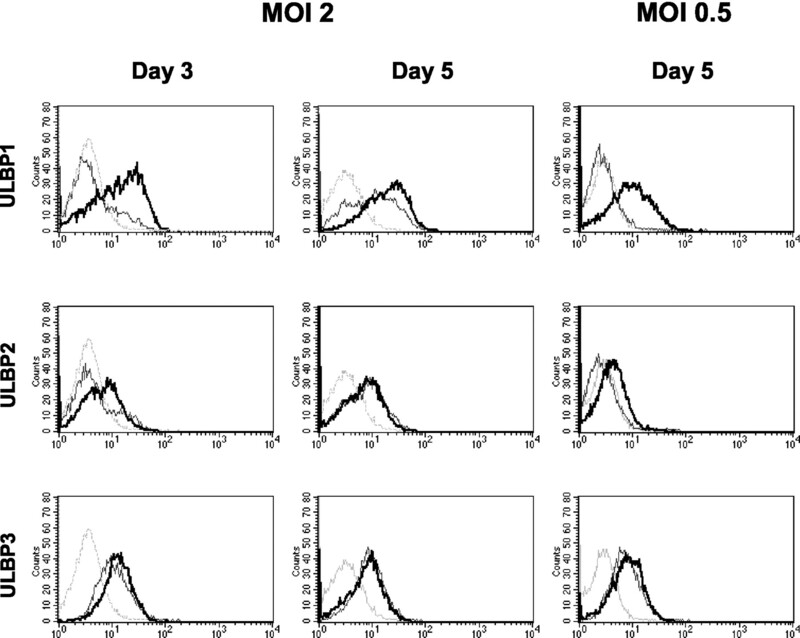 Effect of UL16 on ULBP1-3 expression in HL fibroblasts at day 3 postinfection (MOI 2). Dotted histogram: AD169ΔUL16-infected fibroblasts stained with isotype control; thin grey line: AD169wt-infected fibroblasts stained for ULBP1, ULBP2, or ULBP3; thick black line: AD169ΔUL16-infected fibroblasts stained for ULBP1, ULBP2, or ULBP3. Secondary reagent as in the legend of Fig. 1⇑. Influence of UL16 on NK cell-mediated cytotoxicity against HCMV-infected HL fibroblasts at day 3 postinfection (MOI 2). Effect of blocking anti-NKG2D mAb on NK cell-mediated killing of uninfected, AD169wt, or AD169ΔUL16-infected HL fibroblasts in 4 h chromium-release assays; preincubation of effector cells with anti-NKG2D (•), anti-CD56 (□, isotype control), or no Ab (▴). One representative experiment of three is shown. Next, we set out to determine whether the modulation of ULBP1 and ULBP2 surface expression by means of UL16 during an ongoing infection was sufficient to influence NKG2D-mediated recognition of infected cells by NK cells. To address this question, we performed cytotoxicity assays using polyclonal NK cells as effector cells and AD169wt- or AD169ΔUL16-infected HL fibroblasts as target cells (Fig. 5⇑). The expectation was that infection with the AD169ΔUL16 virus should result in increased sensitivity to lysis due to the increased ULBP1 and ULBP2 surface expression and that the killing of such cells should consequently be more NKG2D-dependent than that of cells infected with AD169wt. Both predictions were confirmed. Our results show that during HCMV infection: 1) the NKG2D ligands ULBP1-3, as well as MICA, are up-regulated; 2) the viral protein UL16 interferes with the cell surface expression of ULBP1 and 2; however, 3) ULBP1, as well as UL16, is readily detectable intracellularly in the ER; 4) the NKG2D-dependent activation pathway becomes the major component of NK cell recognition of infected cells; 5) UL16 targets this component; a UL16 mutant virus induced higher NK susceptibility, an effect that could be completely blocked by an anti-NKG2D Ab. This is, to our knowledge, the first time that targeting of an NK cell activating pathway by HCMV during an ongoing infection is shown. During the preparation of this manuscript, another study reported that all ULBPs, as well as MICA and MICB, are up-regulated by HCMV at the mRNA level (27). On the cell surface, MICA and ULBP3 became detectable while at the same time constitutively expressed ULBP2 was down-regulated. The use of different mAbs and fibroblasts (MRC-5 in the study by Welte et al. (27) compared to HL fibroblasts in our experiments) might explain the discrepancy in regard to ULBP2 expression on uninfected cells. Furthermore, the study by Welte et al. (27) did not follow the surface expression of NKG2D ligands beyond day 3 postinfection. Our data suggest that at this time point, even at higher MOIs, the cell surface up-regulation is only about to start. The use of a UL16 deletion mutant virus allowed us to directly test the hypothesis that the delay in expression of ULBP1 and 2 (compared to ULBP3) is caused by UL16. In the absence of UL16, the kinetics of ULBP1 and 2 up-regulation at a higher MOI followed that of ULBP3. In a pathophysiological situation, sites with high as well as with low MOI probably coexist. It is interesting in this context that at lower MOI (0.5), the impact of UL16 was even more pronounced: no up-regulation of ULBP1 and 2 was detected throughout the observation period with the AD169wt virus, while infection with AD169ΔUL16 resulted in surface staining for all three ULBPs. Although at higher MOIs, the up-regulation of ULBP1 and ULBP2 was delayed on the surface compared to ULBP3, all three proteins were expressed and detected intracellularly at the same time. Together with their colocalization with UL16, predominantly in the ER, this finding is consistent with intracellular retention in this compartment by the viral protein during infection. Our attempts to coimmunoprecipitate UL16 and ULBPs have failed so far, possibly due to very weak interactions between these proteins (D. Cosman, unpublished data). However, there is indirect support for this model also from other studies. A soluble form of the HCMV-encoded glycoprotein UL16 has been shown to bind ULBP1, ULBP2, and MICB and to compete with soluble forms of these NKG2D ligands for binding to NKG2D (15). However, soluble UL16 did not affect NK cell cytotoxicity against target cells expressing ULBP1 or ULBP2 on the cell surface, suggesting that a physiologically relevant interaction between these molecules might take place at an intracellular location (29). Indeed, evidence for a direct interaction has recently been obtained by systems based on transfection of 293T cells with a UL16 construct (27) or on cotransfection of ULBPs and UL16 in EL-4 cells, which led to a reduced surface expression of ULBP1 and ULBP2 but not ULBP3 (29), demonstrating that UL16 is sufficient to down-modulate NKG2D ligands. Together with these observations, our results support a model based on selective retention of ULBP1 and ULBP2 via UL16 in the ER of infected cells. As previously shown, overall NK susceptibility of AD169-infected cells was variable; there was no reproducible change compared to uninfected cells. Despite this variability, our data consistently showed that the killing of uninfected fibroblasts was mainly NKG2D-independent, whereas NKG2D ligands became the main contributors to NK cell-mediated cytotoxicity against HCMV-infected cells. The reason for the small NKG2D-dependent component in killing of uninfected cells is unknown. Although we did not detect any of the five known NKG2D ligands on the surface of uninfected cells, it is also possible that flow cytometry is not sensitive enough to detect very low levels of NKG2D ligands on the cell surface of uninfected cells which might still be sufficient to deliver a physiologically relevant signal via NKG2D. Alternatively, there might be other as yet unknown ligands for this receptor. This appears even likely given the flexibility of this receptor to bind ligands with diverse structure and the recent identification of a new NKG2D ligand in the mouse (17, 30, 31). Blocking the ligands of NKG2D on target cells should reveal more information in this regard. The major contribution of NKG2D ligands to residual NK cell-mediated killing of HCMV-infected fibroblasts makes them an appealing target for viral gene products dedicated to immune evasion. The fact that NKG2D is expressed on cells of the innate as well as the adaptive immune system makes this concept even more attractive. The use of the UL16 deletion mutant of the HCMV strain AD169 allowed us to directly assess the role of UL16 in infected fibroblasts in regard to the NKG2D receptor-ligand system. Cells infected with this mutant virus showed a marked increase in susceptibility to NK cell killing compared to AD169wt-infected cells. Blocking NKG2D on the effector cell reduced lysis to the same levels both in AD169wt- and AD169ΔUL16-infected cells. These results indicate that ULBP1 and ULBP2 were indeed responsible for the increased lysis observed upon infection with the mutant virus. Could the complete prevention of ULBP1 and 2 surface expression at a low MOI throughout the observation period allow the virus to escape from NK cells, even if ULBP3 was readily expressed? So far, it is unclear why UL16 does not bind ULBP3 or MICA which could also potentially endanger viral survival. The former molecule has been shown to exhibit the weakest biological activity in regard to NK cell activation within the ULBP family so it might be affordable for HCMV “to miss” this molecule with UL16. However, MICA has been shown to be a potent molecule in activating NK cells or providing costimulation for T cells (13, 24). Therefore, it appears possible that there are other viral gene products targeting MICA and/or ULBP3. At high MOI, UL16 mediated only a delay in the up-regulation of ULBP1 and ULBP2. But even this short-lasting effect might open a decisive “window of opportunity” for HCMV, ensuring immune evasion from NK cell-mediated responses at a very crucial time point of infection. Given that a replication cycle of HCMV takes 48–72 h, a delay of HCMV-induced ULBP1 and ULBP2 surface expression by 24–48 h might significantly increase the amount of viral copies, or merely allow the completion of the replication cycle before the infected cell is detected and eliminated by the immune system. Our findings emphasize the complexity of events in an ongoing infection and highlight the importance of studying HCMV in infected cells, instead of relying solely on overexpressing transfection systems. Because overall lysis of infected cells is similar or even reduced compared to uninfected cells while NKG2D dependency is increased, our results imply that HCMV interferes with other, NKG2D-independent, activating pathways as well (Fig. 3⇑). The virus may have evolved this to avoid “missing self recognition” that would otherwise result from down-regulated MHC class I expression, another effect of the virus (32). Mechanistically, this could be achieved by inducing alternative inhibitory ligands, by targeting activating ligands for receptors other than NKG2D, or by interfering with intracellular pathways affecting susceptibility to lysis. In support of the latter hypothesis, UL16 has recently been shown to mediate a general resistance to cytolytic proteins (33). Whatever the mechanisms for viral interference with NKG2D-independent pathways are, we speculate that the induction of NKG2D ligands such as ULBP in response to the virus has developed as a countermeasure in host evolution, followed by the UL16 protein as the next move from the virus. Yet both measures are not entirely successful: UL16 does reduce NKG2D ligand expression on infected cells thereby decreasing susceptibility to lysis, though in certain conditions of infection (e.g., at later time points after infection with higher MOI) the cellular response toward infection is strong enough to achieve elevated, functionally relevant levels of NKG2D ligands. An analogous evolutionary arms race may have taken place between murine CMV and its host, where certain mouse strains have evolved activating NK receptors recognizing viral proteins, which originally evolved to facilitate escape by targeting inhibitory NK receptors (34). The interplay between virus and host cells during infection does not only provide the opportunity to learn about the mechanisms of lifelong latency and immune evasion but should also yield a new perspective on how the immune system can be influenced, which might ultimately lead to novel therapeutic approaches. We acknowledge the work of Helena Browne and Jan Chalupny who generated valuable reagents. We also thank Angela Santoni for helpful discussions and critically reading the manuscript. ↵3 Current address: Department of Experimental Medicine and Pathology, Policlinico “Umberto I”, University “La Sapienza”, Rome, Italy. ↵4 Abbreviations used in this paper: HCMV, human CMV; ULBP, UL16-binding protein; MIC, MHC class I-related chain; HL, human lung fibroblast; HF, human foreskin fibroblast; MOI, multiplicity of infection; TR, Texas Red; ER, endoplasmic reticulum. Mocarski, E. J. J.. 1996. Cytomegaloviruses and their replication. B. N. Fields, and D. M. Knipe, and P. M. Howley, and R. M. Chanock, and J. L. Melnick, and T. P. Monath, and B. Roizman, and S. E. Strauss, eds. In Virology Vol. 2: Lippincott-Raven, Philadelphia. Soderberg-Naucler, C., K. N. Fish, J. A. Nelson. 1997. Reactivation of latent human cytomegalovirus by allogeneic stimulation of blood cells from healthy donors. Cell 91:119. Orange, J. S., M. S. Fassett, L. A. Koopman, J. E. Boyson, J. L. Strominger. 2002. Viral evasion of natural killer cells. Nat. Immunol. 3:1006. Vilches, C., P. Parham. 2002. KIR: diverse, rapidly evolving receptors of innate and adaptive immunity. Annu. Rev. Immunol. 20:217. Lopez-Botet, M., M. Llano, F. Navarro, T. Bellon. 2000. NK cell recognition of non-classical HLA class I molecules. Semin. Immunol. 12:109. Ljunggren, H. G., K. Karre. 1990. In search of the “missing self”: MHC molecules and NK cell recognition. Immunol. Today 11:237. Braud, V. M., P. Tomasec, G. W. Wilkinson. 2002. Viral evasion of natural killer cells during human cytomegalovirus infection. Curr. Top. Microbiol. Immunol. 269:117. Cosman, D., N. Fanger, L. Borges, M. Kubin, W. Chin, L. Peterson, M. L. Hsu. 1997. A novel immunoglobulin superfamily receptor for cellular and viral MHC class I molecules. Immunity 7:273. Krmpotic, A., D. H. Busch, I. Bubic, F. Gebhardt, H. Hengel, M. Hasan, A. A. Scalzo, U. H. Koszinowski, S. Jonjic. 2002. MCMV glycoprotein gp40 confers virus resistance to CD8+ T cells and NK cells in vivo. Nat. Immunol. 3:529. Wu, J., Y. Song, A. B. Bakker, S. Bauer, T. Spies, L. L. Lanier, J. H. Phillips. 1999. An activating immunoreceptor complex formed by NKG2D and DAP10. Science 285:730. Sutherland, C. L., N. J. Chalupny, K. Schooley, T. VandenBos, M. Kubin, D. Cosman. 2002. UL16-binding proteins, novel MHC class I-related proteins, bind to NKG2D and activate multiple signaling pathways in primary NK cells. J. Immunol. 168:671. Radaev, S., B. Rostro, A. G. Brooks, M. Colonna, P. D. Sun. 2001. Conformational plasticity revealed by the cocrystal structure of NKG2D and its class I MHC-like ligand ULBP3. Immunity 15:1039. Stephens, H. A.. 2001. MICA and MICB genes: can the enigma of their polymorphism be resolved?. Trends Immunol. 22:378. Kubin, M., L. Cassiano, J. Chalupny, W. Chin, D. Cosman, W. Fanslow, J. Mullberg, A. M. Rousseau, D. Ulrich, R. Armitage. 2001. ULBP1, 2, 3: novel MHC class I-related molecules that bind to human cytomegalovirus glycoprotein UL16, activate NK cells. Eur. J. Immunol. 31:1428. Groh, V., R. Rhinehart, H. Secrist, S. Bauer, K. H. Grabstein, T. Spies. 1999. Broad tumor-associated expression and recognition by tumor-derived γδ T cells of MICA and MICB. Proc. Natl. Acad. Sci. USA 96:6879. Zwirner, N. W., K. Dole, P. Stastny. 1999. Differential surface expression of MICA by endothelial cells, fibroblasts, keratinocytes, and monocytes. Hum. Immunol. 60:323. Kaye, J., H. Browne, M. Stoffel, T. Minson. 1992. The UL16 gene of human cytomegalovirus encodes a glycoprotein that is dispensable for growth in vitro. J. Virol. 66:6609. Cerboni, C., M. Mousavi-Jazi, A. Linde, K. Soderstrom, M. Brytting, B. Wahren, K. Karre, E. Carbone. 2000. Human cytomegalovirus strain-dependent changes in NK cell recognition of infected fibroblasts. J. Immunol. 164:4775. Li, P., G. McDermott, R. K. Strong. 2002. Crystal structures of RAE-1β and its complex with the activating immunoreceptor NKG2D. Immunity 16:77. Diefenbach, A., J. K. Hsia, M. Y. Hsiung, D. H. Raulet. 2003. A novel ligand for the NKG2D receptor activates NK cells and macrophages and induces tumor immunity. Eur. J. Immunol. 33:381. Fletcher, J. M., H. G. Prentice, J. E. Grundy. 1998. Natural killer cell lysis of cytomegalovirus (CMV)-infected cells correlates with virally induced changes in cell surface lymphocyte function-associated antigen-3 (LFA-3) expression and not with the CMV-induced down-regulation of cell surface class I HLA. J. Immunol. 161:2365. Odeberg, J., H. Browne, S. Metkar, C. J. Froelich, L. Brandén, D. Cosman, Söderberg-Nauclér. 2003. The human cytomegalovirus protein UL16 mediates increased resistance to natural killer cell cytotoxicity through resistance to cytolytic proteins. J. Virol. 77:4539. Arase, H., E. S. Mocarski, A. E. Campbell, A. B. Hill, L. L. Lanier. 2002. Direct recognition of cytomegalovirus by activating and inhibitory NK cell receptors. Science 296:1323.